ANNA OLSON’S FIRST job in Jackson Hole was selling advertising for a CD-ROM project. It was 1996 and she had moved here from London to marry Jeff Olson, a native of Gardiner, Montana. “So, unlike most people, I moved here for the love of a person and [then] fell in love with the place,” Olson says. 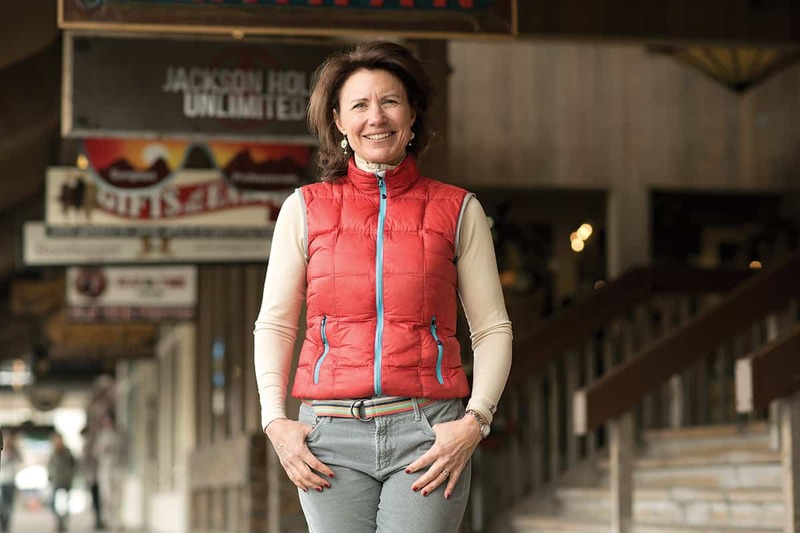 A native of Hampshire, on England’s southern coast, Olson left CD-ROM advertising in 1997 to become communications manager for Jackson Hole Mountain Resort. She worked at the resort for twenty years, during which time her three kids went through the Kids Ranch program. “I’m thankful to be here every day. There’s the obvious reasons and then there’s this community,” she says. 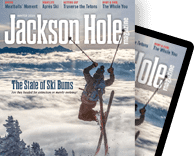 “Once you connect with it, and I know this is cliché, but you get as much out of as you give it.” Olson has been on the boards of the Community Children’s Project, the Jackson Hole Chamber of Commerce, and Vertical Harvest. Last summer she started as president/CEO at the chamber. Q: Do you remember your initial impressions of the valley? A: I couldn’t get over that this was a place we had landed by default. Or fate or luck, whatever word you want to choose. Q: Were you a skier when you were hired to work at JHMR? A: I was a very, very low-average skier. Skiing in Europe is just recreation and a fun thing to do in the sun. Most English people, they don’t want fresh snow. A: I think I’ve graduated from where I started. Jackson has taught me to just really, really enjoy skiing. One thing I’ve learned is that every day skiing is good. It doesn’t matter about the conditions. Q: After twenty years of working for JHMR, employees get a lifetime ski pass. You left right after you had put in twenty years. Coincidence? A: It truly, truly was not a factor. Timing has always been on my side. Q: What did factor into the decision to leave JHMR? A: A couple of years ago I was thinking that I could stay there for another ten years and enjoy it. The future of the ski industry is really interesting to me, especially with [JHMR] being independently owned. But I equally realized that I could try something else. I did look outside the valley, and quickly came to the conclusion I didn’t want to market another ski area. Q: So, the Chamber of Commerce? A: When I started having the conversation about leaving JHMR, my friend Shelley Simonton was part of it. In 2016 she was hired as president/CEO of the chamber. At the time, she was dealing with cancer and we all thought it was treatable. When it became obvious that her cancer was terminal, it took her two weeks to call me and tell me, “Anna, you should go for the chamber job.” With that, I threw my hat in and found out I got the job ten days before she passed. Q: “Bittersweet” doesn’t even begin to describe that. A: After I got the job, [Shelley and I] cried and laughed a lot. She was so excited for me, though. Q: You’ll have been on the job for a year in early July. Are you excited? A: I feel like I’m making a worthwhile difference. The job is very social, but with meaning. I work on behalf of members to support a vibrant economy. Also, I’m very curious, which this job feeds. I learn about people and their businesses every day. Q: What’s an unsung business here? A: How about an unsung season? Spring, I feel, is just the most incredible time here. There’s such a sense of reawakening.